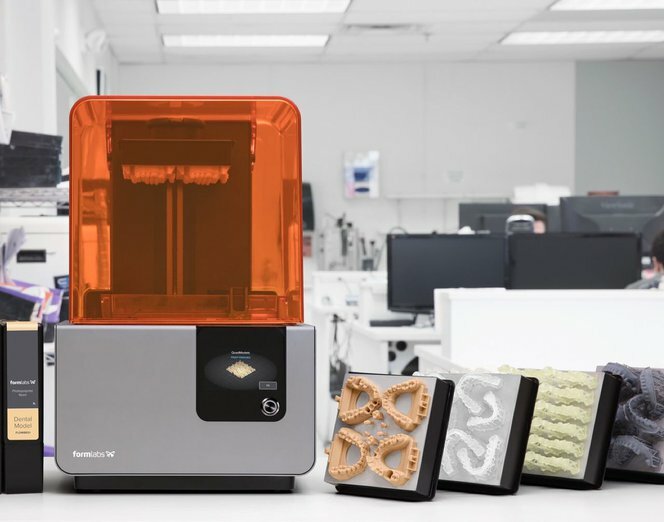 Dental milling centers and laboratories have been casting and pressing metal and ceramic parts for over ten years, but existing CNC and 3D printing solutions are often costly and difficult to use. 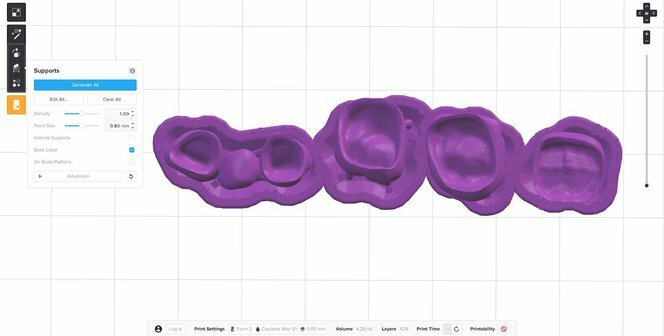 This application guide details the simplified process of casting and pressing dental crowns, bridges, and frames using the Form 2 desktop stereolithography 3D printer and Castable Wax Resin, from start to finish. 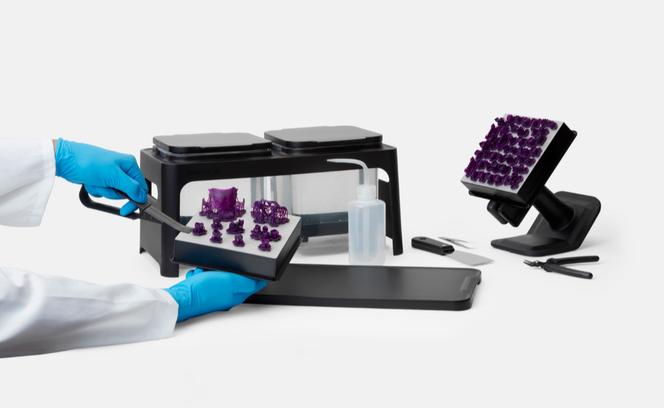 Tested at length by dental technicians, Formlabs Castable Wax Resin provides accurate, sealed margins and contains 20% wax for reliable casting with clean burnout. Printed patterns are strong enough to handle with no post-cure required, allowing for a faster, simpler workflow. 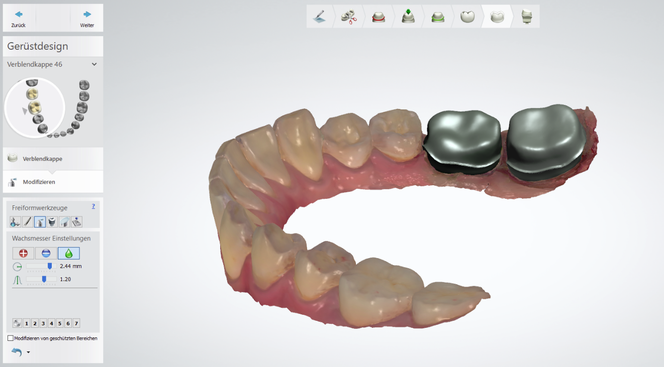 Dental CAD software requires a digital impression to create a crown, bridge, or frame. 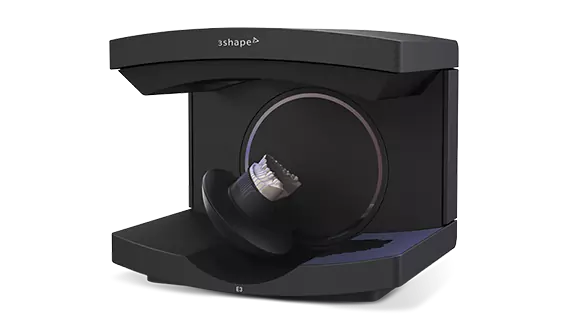 Capture the digital impression either directly, using an intraoral scanner, or indirectly, using a desktop optical scanner, to scan a polyvinyl siloxane (PVS) impression or stone model. Unless working inside a complete scan and CAD system, export the scan as an open file in STL format. 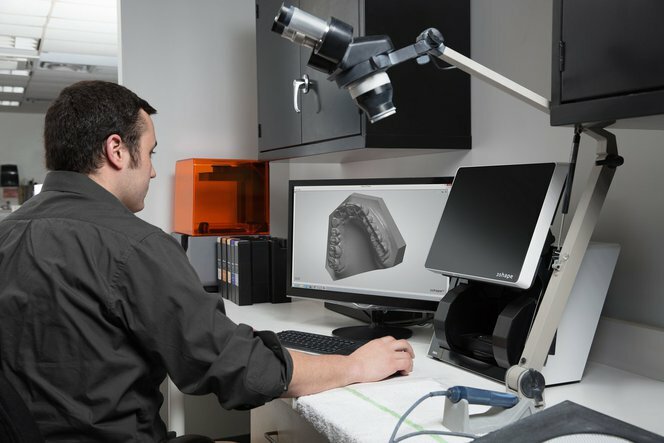 After capturing the digital impression, import the scan files into the dental CAD software and design the restoration or appliance. 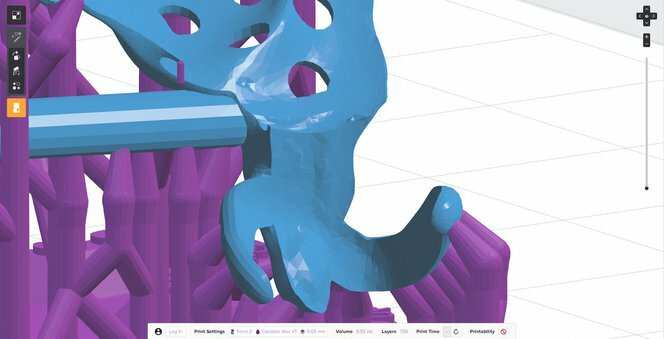 Select dental CAD software that offers open STL file export to ensure compatibility with Formlabs PreForm print preparation software. Exact importing and design procedures vary by software package. For additional help, contact the software reseller or manufacturer. 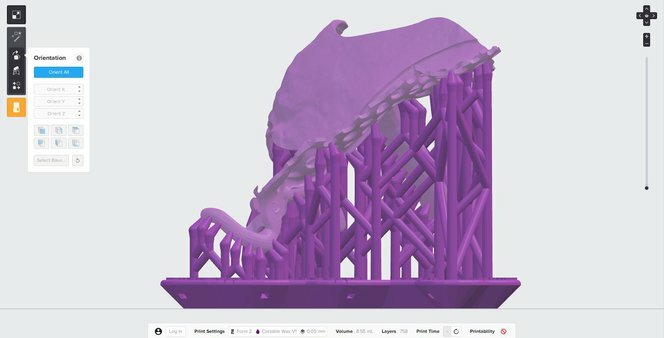 Design your fixed case using the material settings provided by Formlabs (see “CAD Material Settings”). To increase consistency and reduce distortion of 3D printed frame patterns, add a stabilization bar with a diameter of 2.5 mm. When designing clasps thinner than 0.8 mm, connect the clip arms together for the most accurate results. 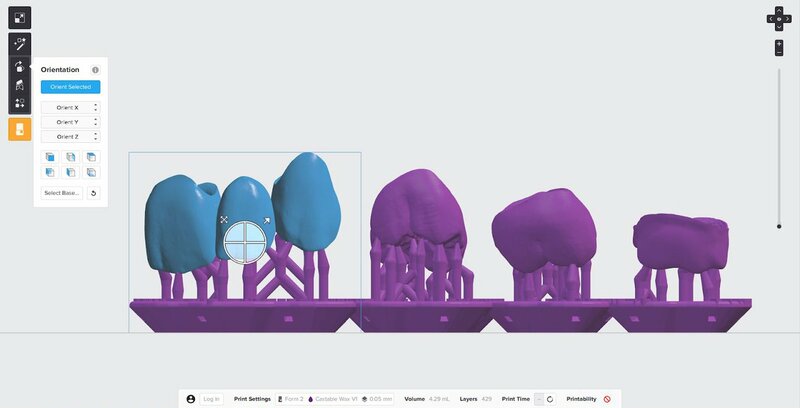 You can create the casting sprues in the CAD software and print them directly. This saves time that would be spent manually placing sprues. 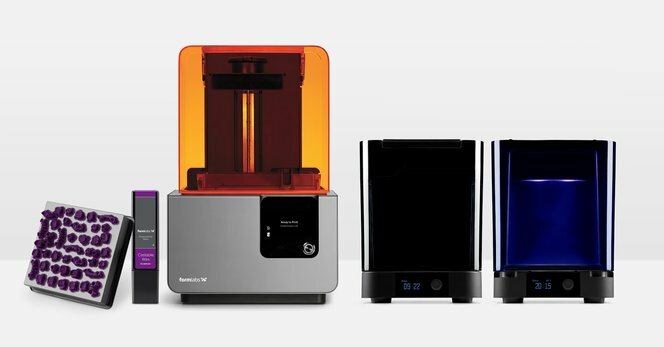 Open Formlabs PreForm print preparation software and import the STL or OBJ file(s) generated by the dental CAD software. In the “Print Setup” menu in PreForm, select your printer based on its Serial Name. Select “Castable Wax” from the “Material” menu. Print wax patterns at 0.05 mm thicknesses to reduce print times and ensure clinically acceptable accuracy. Always print with supports. For the best results and the lowest post processing effort, follow the best practices below. 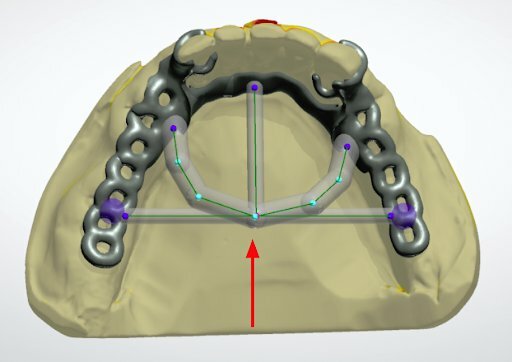 Position crown and bridge patterns with the fitting areas or margins facing upwards. This prevents the possibility of adding supports to the most critical part of the restoration. 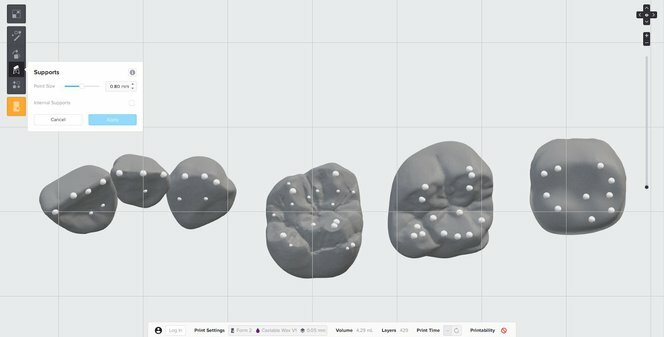 For full contour crown and bridge patterns, place support touchpoints on the cusp tips and ideally not on the contact areas of the crown. Always check the margin and internal aspect of the restoration to confirm that supports have not been generated in those critical areas. If additional support is needed, manually add supports where appropriate. Position your RPD frame with the intaglio surfaces facing up. Manually remove and place supports as needed by clicking “Edit All” in the “Supports” menu. Place supports on the outer surfaces of the clasps. 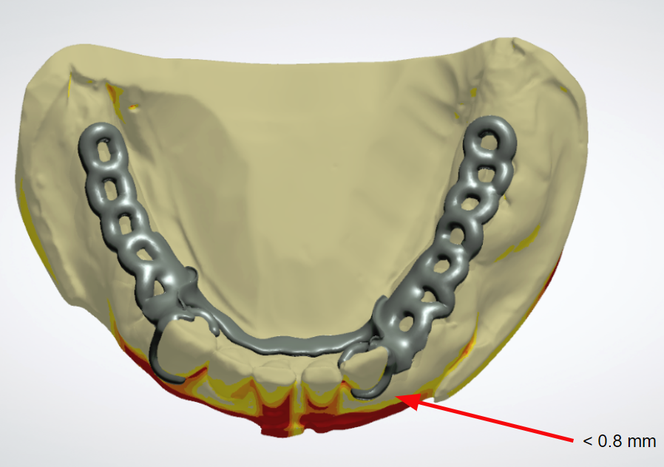 Avoid placing supports on surfaces that will come in contact with the patient’s dentition or other important areas of the partial denture frame. Support each clasp with 4-5 evenly distributed supports along the clasp tip to the shoulder. Thoroughly agitate the resin cartridge by shaking and rotating it several times. 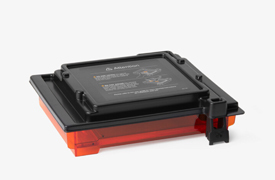 Insert the resin tank, the Castable Wax Resin cartridge, and the build platform into the printer. If you are using a Form Wash automated washing system, leave the printed parts on the build plate for washing. Align the top lip of the build platform with the arms of Form Wash’s platform mount, and fully insert to touch the back. Wash parts with isopropyl alcohol (IPA) with a concentration of 90% or higher (99% is recommended). Set Form Wash to 15 minutes, and start the wash cycle. If you are using a Finish Kit, carefully remove parts from the build platform once the build is complete. Firmly insert the included scraper into the chamfer of the support raft, then twist the scraper gently from side to side. Rinse the parts in two buckets of isopropyl alcohol, with an initial bath of 10 minutes, and a second bath of 5 minutes. IPA with a concentration 99% or higher is recommended but 90% or higher will work. Washing Castable Wax parts will stain the IPA and future washed parts purple. To avoid staining parts printed with other resins, wash Castable Wax parts in a dedicated Form Wash or Finish Kit. Air dry parts or use a compressed air hose to blow IPA away from surfaces. Inspect parts closely to ensure all uncured resin has been removed. Repeat wash if necessary. Let the patterns dry completely before use. 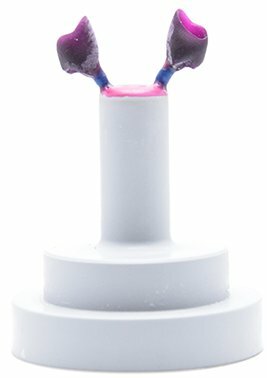 Castable Wax Resin was designed for use without post-curing. For the highest accuracy, we do not recommend post-curing printed patterns, as this can result in a small amount of shrinkage. Print, process, and cast or press patterns as soon as possible after printing. If this is not possible, store washed Castable Wax patterns in a cool and dark place. Use the flush cutters included in the Finish Kit to carefully cut the supports at the touchpoints (where they attach to the part). Consider wearing safety glasses when cutting the supports, as the material may be brittle and small pieces of supports can fly off. Supports can also be removed using dental handpieces, such as cutting discs, burs, and polishing wheels. 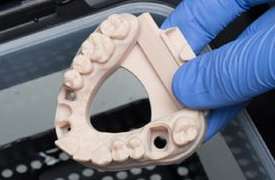 Very thinly designed parts, like removable partial dentures (RPDs), are easy to break during the support removal process. Using a cutting disc is recommended. Position the crowns and bridges in the mold outside the heat center, about 5 mm from the mold wall. 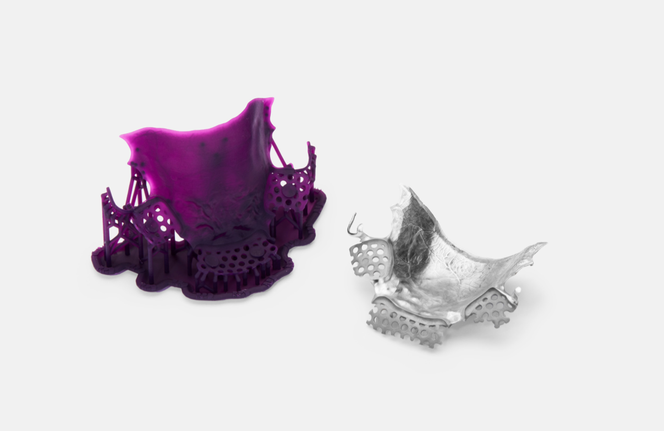 Individual crowns can be grown directly onto the casting mold former using a 2.5 mm wax wire (optionally with a cast reservoir). Bridges, on the other hand, should be connected to a 5 mm distribution channel with a 2.5 mm wax wire at a 45 ° angle and waxed to the casting mold shaper using a 4 mm wax wire. Always fix the sprues to the most solid areas of the structure. 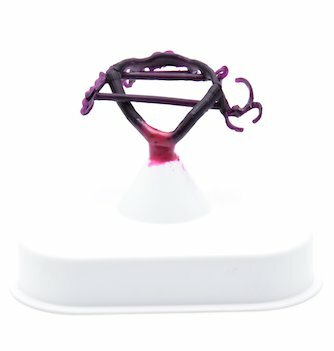 Two curved 3.5 to 4 mm casting channels are recommended, connected to the funnel 5 to 10 mm above the highest point of the object. 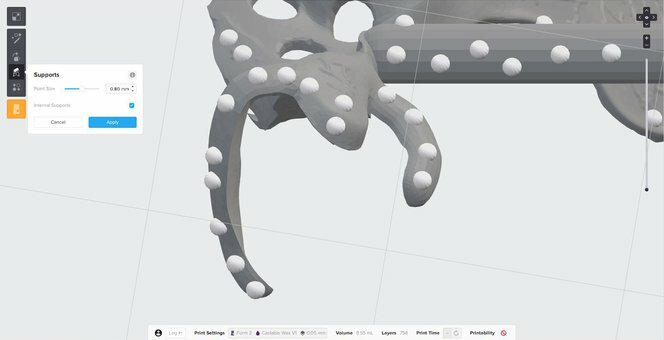 Thicker areas of the construction only accessed via thin areas can be optionally connected to an additional 3 mm casting channel, as the alloy will always flow from thick to thin. Crowns and bridges are sprued directly with a 2.5 to 3 mm wax wire (without corners and edges) at a 45 to 60 ° angle to the mold cavity former. Place sprues on the thickest area of the pattern. For crowns, this is generally a cusp tip. Bridges should have a sprue on each abutment and pontic (do not attach a sprue to a bridge connector). The casting channel should be between 4 and 8 mm long, and the total length including the press object should not exceed 16 mm long. The distance to the wall of the silicone ring should be at least 10 mm. Casting with Castable Wax Resin requires a high heat bonded phosphate investment. 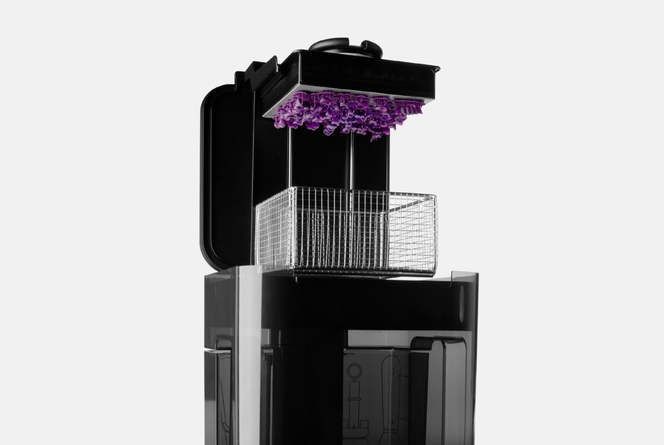 Formlabs tested burnout schedules with two investments: BEGO Bellavest SH and WiroFine. The burnout schedules are the same for both investments with variance on the final temperature. Always refer to the investment manufacturer’s recommendations. For a successful casting or pressing process, observe the manufacturer’s specifications, especially matching the preheating and casting or pressing temperature to the alloy. Castable Wax is 21% heavier than standard wax. For example, if your alloy or ceramic recommends 1 ingot per .75 g in standard wax, the correct weight per 1 ingot of Castable Wax would be .91 g.
This application guide was written in collaboration with Stephan Kreimer. 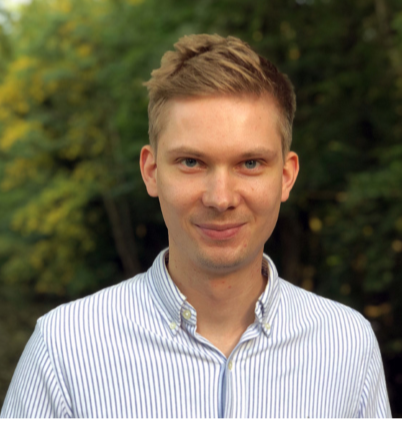 Stephan Kreimer is a master dental technician (MDT) specializing in digital workflow solutions and is a consultant/ beta tester for several dental companies. He owns and operates Kreimer Dentallabor GmbH & Co. KG, a dental laboratory in Warendorf, Germany.